A bride-to-be had her hen party advertised on a billboard in the centre of Cardiff as a wedding gift from her friends. 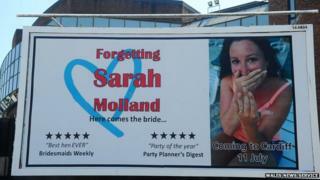 Sarah Molland, 25, from Birmingham, was on her hen night when she saw the giant poster near the Motorpoint Arena. Her friends chipped in to pay £500 for the 24ft x 12ft billboard based on the film Forgetting Sarah Marshall. Miss Molland said: "My first thought was 'I'll kill them' but I was delighted really." Rachael Coombs, 25, Miss Molland's maid of honour and best friend, spent months making the arrangements ahead of the hen night for 15 women. Miss Molland, who studied criminology at Cardiff University, said: "It was a night to remember - I enjoyed being a poster girl but it was weird seeing my picture that huge." She is marrying fiancee Paul Jones, 26, in Birmingham in August. The billboard was still up more than a week after the hen do on 11 July.